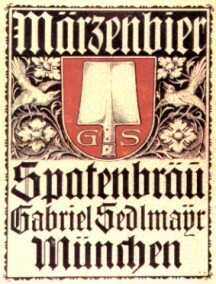 The familiar Spaten logo appears in this design for Märzenbier created by Otto Hupp. The initials on each side of the logo pay honor to Gabriel Sedlmayr who was responsible for the breweries growth through the 19th century. 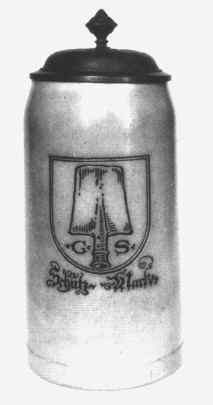 Both the logo and the name Spaten derive from Spaeth, the name of the family which operated the brewery over seven generations from 1622 until it was acquired by Sedlmayr in 1807. The history of the Spaten Brewery dates to the mid-14th century, but its modern history begins in 1807 when the Bräumeister for the royal court, Gabriel Sedlmayr took its helm and began its expansion. By 1820 the brewery had improved its standing among 52 Munich brewers from last to third, as measured by malt consumption. In 1830 beer was first sold to Munich's famous Hofbräuhaus. Gabriel II and his brother Joseph became co-owners in 1840 following the death of their father, and just one year later Joseph sold his interest to Gabriel. The first batch of what we know today as Märzenbier, a lighter, amber-colored beer in the "Vienna style", was brewed in 1871, and was first served at Munich's famous Oktoberfest in 1872 when other beer supplies ran out. The new beer was a smash hit with festival attendees, and continues to be a favorite Oktoberfest brew to this day. The well-known Spaten coat-of-arms, designed by Otto Hupp, was recorded in the registry of trademarks in Munich in 1884. The innovative brewer and pioneer, Gabriel Sedlmayr the Elder, is honored with his initials on the logo. Interestingly, the family Spaeth, which owned the brewery prior to selling it to Gabriel Sedlmayr, contributed both the name (Spaten as a corruption of Spaeth) and the image of the spade on the logo. Spaten today enjoys a position as Germany's 2nd largest export brewery. The saltglazed stein shown to the right, bearing the incised logo created by Otto Hupp in 1884, was made about 1904 by the firm of Reinhold Merkelbach for Spatenbräu. For more information about Spatenbräu, visit the web site of SpatenUSA.